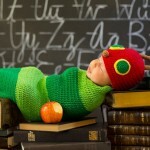 Era of Make Believe is an Etsy shop that specializes in creating handmade, quality costumes for children and teens. Shop owner Lyn Tayler Lee is originally from Australia but moved to the United States as a young adult. It was here she realized how much both American children and adults like to get into the fun of dressing up in costume. She then decided to put the sewing skills that she had acquired as a teen to work to form her own online shop where she designs and makes fabulous costumes that are fashionable, quality constructed, and comfortable. 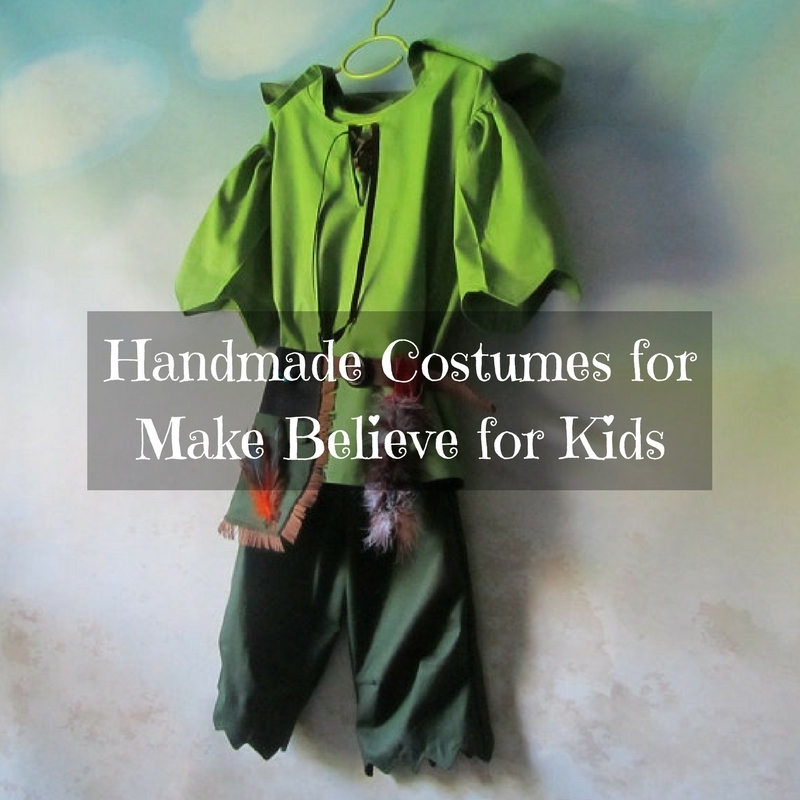 Some of her handmade costumes for make believe fun included themes such as pirates, Lord of the Rings, Steampunk, Chronicles of Narnia, Peter Pan, Disney themes, Guardians of the Galaxy , storybook characters, and much more. 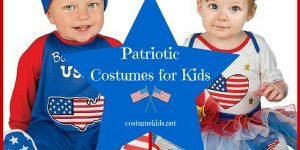 All of these handmade costumes offer quality construction and a one of a kind design that sets them apart from the mass produced store bought costumes. Great detail is put into each and every costume design to really make them look authentic. 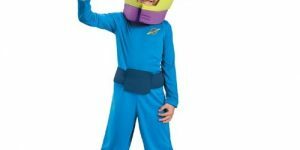 These costumes are perfect for everything from everyday dress up fun, to Halloween, to serious Cosplay. 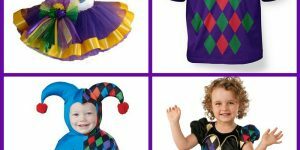 Here we look at some costumes for both boys and girls from Era of Make Believe. This original design is made from 100% cotton fabric and has a 100% faux suede brushed cotton fabric for the tunic. 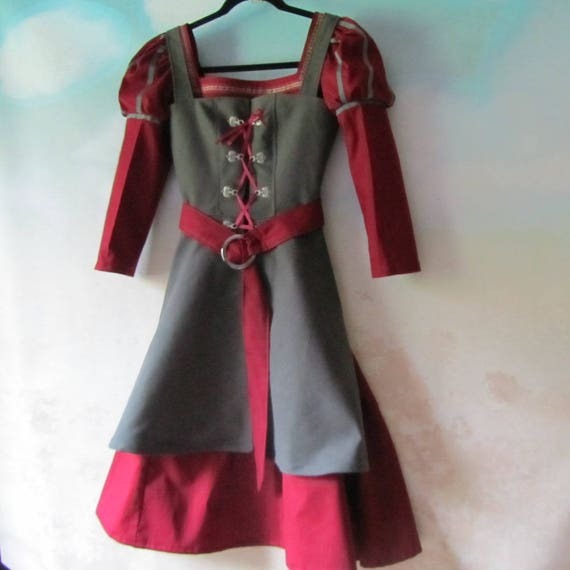 This is a 3/4 length red dress with gray tunic and gray accents. The square neckline is decorated with a multi colored Renaissance ribbon. Dress features over sized puffy sleeves, with front having three panels and the back having two panels. Dress fits loosely at the waist and flares toward the hemline. Tunic has front and back bodice and feature eight antique silver Alpine lacers with burgundy satin ribbon. Belt has a 2 inch metal buckle and is worn dropped at the front. 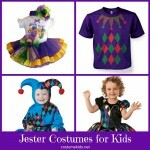 Perfect for Halloween or any Renaissance dress up occasion. Fits sizes 10,12,and 14. This costume could be used to portray such characters as Peter Pan, Robin Hood, or even a forest elf. 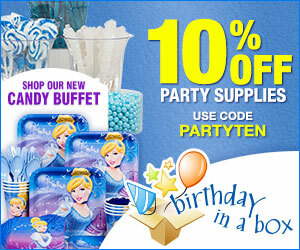 Fits sizes 3 to 8. All fabrics used are made from 100% cotton. The olive green tunic with attached hood has elbow length sleeves and a “frayed” look at the bottom. Slit at neckline laces with brown satin loops and ribbon. Hood is fully lined. 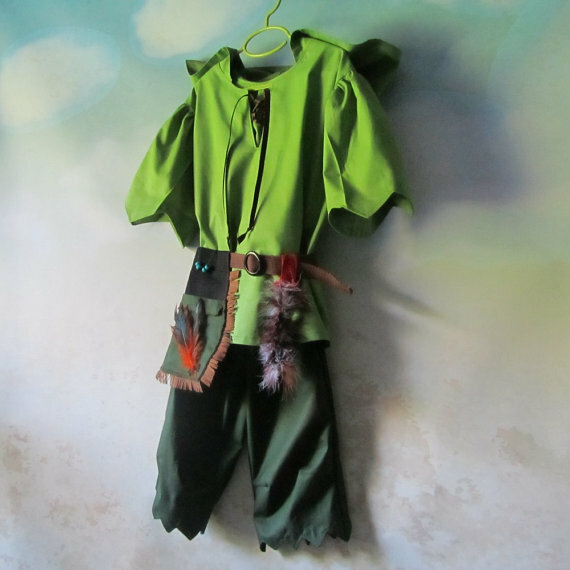 Pants are a forest green color and with elastic and cord at the waist for easy adjustments. Pants fall just below the knee and pants legs have a frayed look at the hem. Includes a belt and a pouch with a feathered tail which can be removed from the belt if desired. 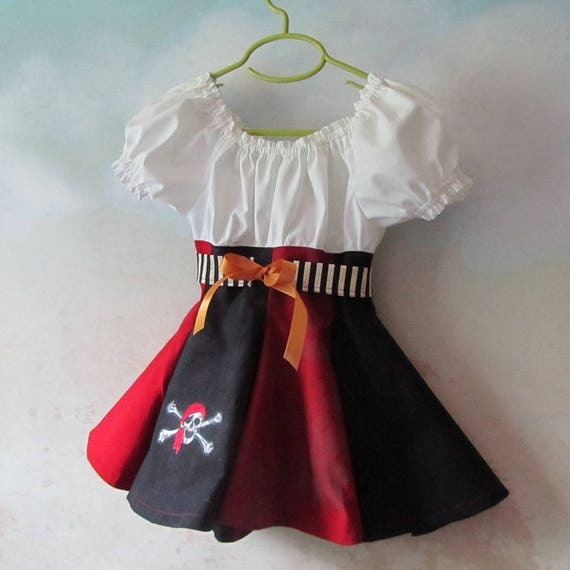 Perfect for dressing as a pirate or as a peasant, this dress features a white bodice with a black and red striped skirt. Skirt features a skull and crossbones wearing a red bandana. 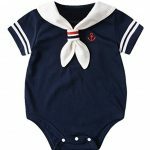 Fits sizes 2/3 and is made from all cotton fabrics. Dress features a white peasant style top with elastic around the shirt sleeves and neckline, with an eight panel skirt in alternating black and red colors. Closes with zipper at the back. Belt is black and cream striped with gold satin ribbon tie. 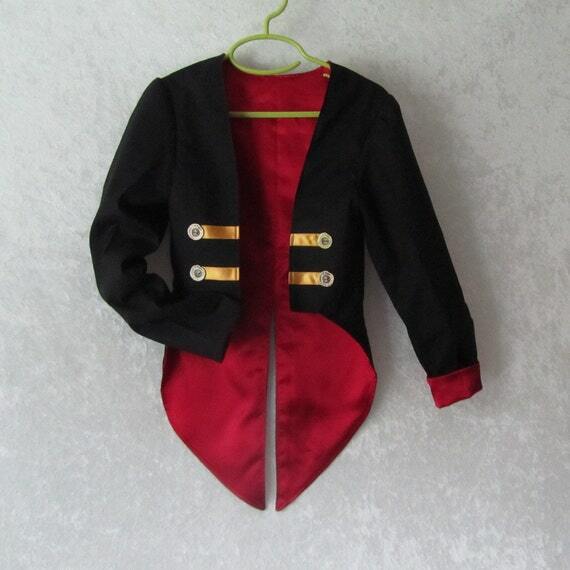 Available in sizes 8 through 14, this tuxedo style jacket is perfect for formal events such as a graduation or wedding, or for dressing up as a ringmaster, pirate, and more. Outer fabric is 100% black cotton with a burgundy satin lining. Features long sleeves that can be worn with or without the cuff. Slit for the back tails starts at the waistline. Each front side has gold satin ribbon with metal buttons and is edge stitched in burgundy and black thread. 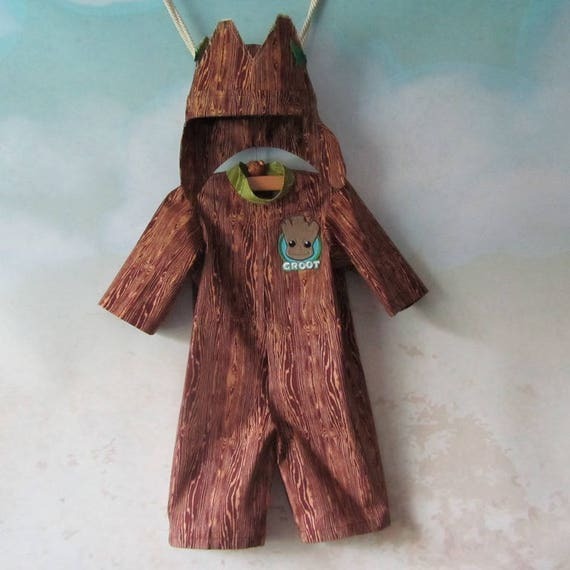 For sizes 3, 6, and 12 months, this is a baby Groot costume in a “tree bark” brown and green fabric.Bodysuit has full length legs and 3/4 length sleeves and features a Baby Groot iron on patch on the chest. The hat/hood is fully lined with a “tree” crown and ear flaps and four attached felt leaves in various shades of green. 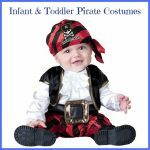 This costume fits child sizes 6, 8, and 10 and includes a fully lined vest, hooded cloak, pants, and shirt made from all cotton fabrics. Cloak is a hunter green flannel with a dragon button and closure at the front. Pants are dark brown with an adjustable cord at the waist. Vest is brown with three metal buttons and buttonholes. Shirt is long sleeved with linen color and elastic at the wrists, with a slit and front fabric tie closures. 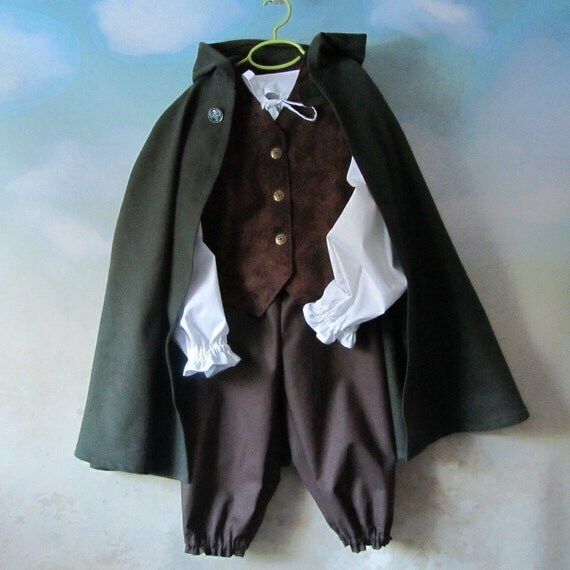 Perfect costume for the Hobbit and Lord of the Rings dress up fun for Halloween or other occasions. 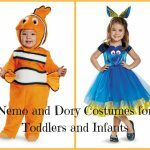 This costume comes in sizes 2 to 4 and is perfect for portraying characters such as Little Red Riding Hood, Heidi, and Gretel from Hansel and Gretel. Dress is red with fully lined bodice and made from 100% cotton lawn fabric. Front insert has black crisscrossing ribbon and floral trim. Sleeves are fully gathered and 3/4 length. Closes at the back with a button. Apron is white, decorated with white organza and burgundy trim. 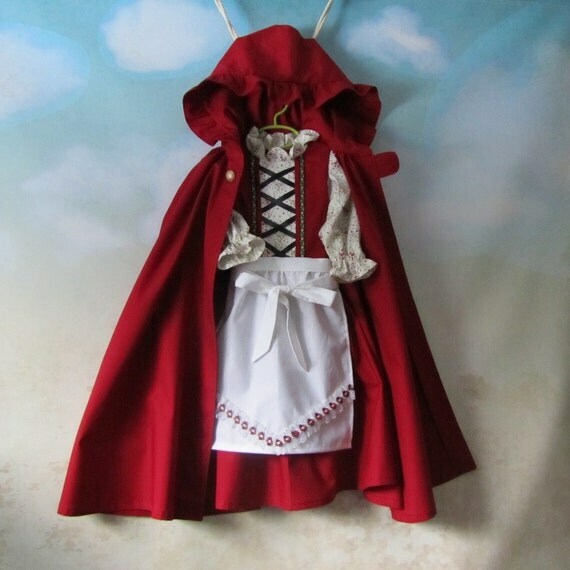 Cloak is a deep red color, fully lined, with wide hood that gathers. 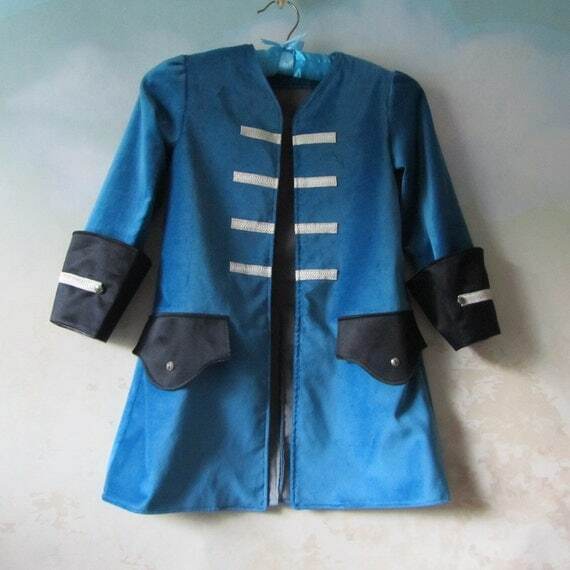 This bright blue coat could be used for Steampunk attire or for such characters as Beast in Beauty and the Beast. 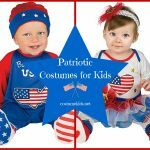 Made from all cotton fabric to fits sizes 2 through 10. Coat is made with a Celestial blue fabric and is fully lined. Cuffs, faux pocket flaps, and back tab are made with black cotton and silk. Decorated with metallic silver bullion braid and metal stud buttons. Coat has a slit in the back. Designed to fit sizes 3 through 8, this cream colored shift dress has a pattern with golden arrows on it, and sleeves are short and open under the arms and can be tied with satin teal colored ribbons. Sleeves and hem are embellished with contrasting light blue and black fabrics. Collar has light blue fabric with silver arrows trimmed in metallic silver and dark blue sequins. Belt is black and decorated with silver balls, with teal blue ribbon that ties at the back. 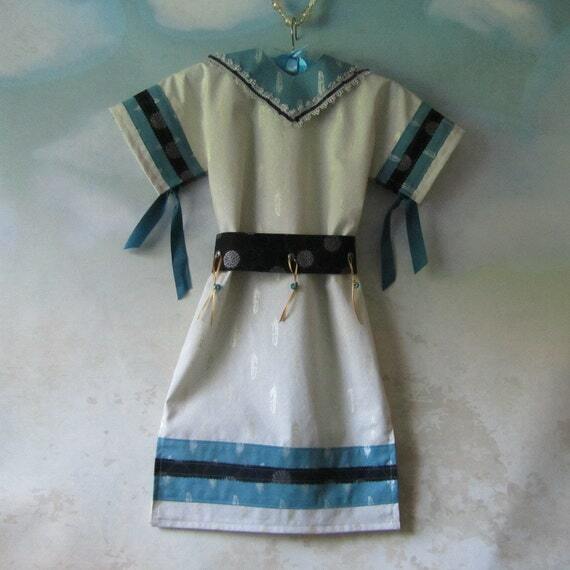 Perfect for portraying Pocahontas and other Native American maidens. 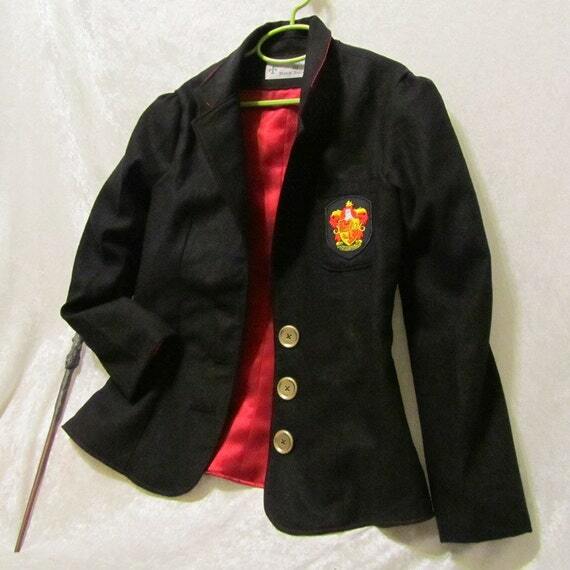 This jacket is a size 11/12 and is perfect for any Harry Potter fan. Jacket is black with a burgundy satin lining.ld down collar with lapels and an embroidered Gryffindor emblem. Three gold metal buttons grace the front of the jacket and give it a polished look. 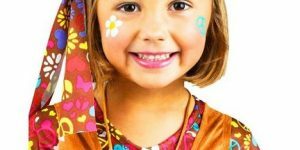 Era of Make Believe is an Etsy shop that specializes in creating handmade, quality costumes for children and teens.